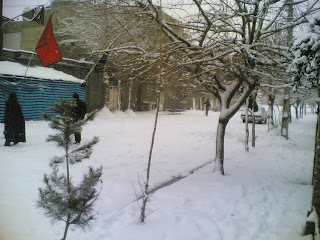 I always wished that I live somewhere cold like north pole or Canada ,but I must confess that I am regret for my wish .it is about 3 weeks that Iran blanketed with snow (epically where I live these days) .I really tired and I wish I could see the color of soil again , these days everything is white and icy .it is about 3 weeks that we only experience the temperature below zero (min -1, max -24). It is also a unique situation for Iran government .it is a real national crisis that government and Mr. President must conquer with it. In first days of crisis most of the roads closed and all the flights canceled even all international flights. Gas ran outing in pipes of the country which has second largest revere of gas in the world.